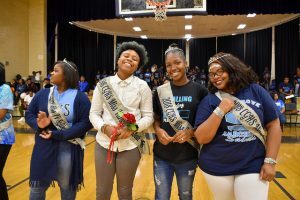 These words echoed through the halls and classrooms of Cedar Grove High School as part of its official homecoming celebration on Wednesday, October 10, 2018. 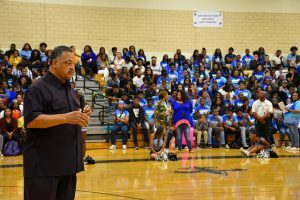 The DeKalb County School District (DCSD) school welcomed civil rights activist, reverend and former politician Jesse Jackson to its celebration, who spoke to students about the importance of having one’s voice heard. Specifically, Jackson challenged students to use their voices at the polls come November 2018. Jackson completed his talk by challenging students to be, act on, and put in action they change they want to see in their own communities and the world at large. Jackson had students hear and repeat mantras for empowerment. After Jackson’s contribution to the homecoming rally and the rally’s conclusion, students had the opportunity to register to vote if they were of legal voting age. Volunteers set up at the school gymnasium to take student information and disseminate it through the appropriate channels. 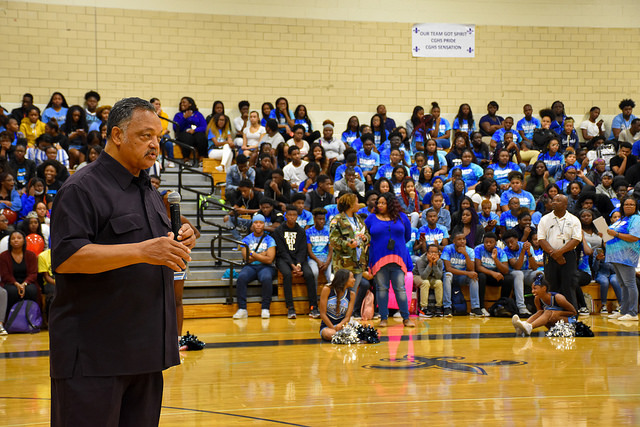 “Reverend Jackson is here for a very special reason,” said Cedar Grove principal Shelton Bernard. Like all DCSD homecoming celebrations, Cedar Grove High School’s own homecoming also included recognition of the school’s Fall 2018 sports teams, the school’s homecoming court, and a general celebration of school spirit. Throughout the week of October 1, students celebrated a “Fashion Flare” day, a “Bohemian Free 2 Be Me” day, as well as a “Blue on Blue Pride” spirit day. Cedar Grove High School’s homecoming football game took place on October 5th against Towers High School. For more information on Cedar Grove High School, visit the school website.